Studio apartment 29 $ / Simferopol / 91 , Kechkemetskaya str. Save Money, Rent Direct from Owner! A cozy, clean and well-maintained studio at a budget price for those who want to be comfortable and not pay too much. WiFi, laundry and cleaning services are included in the price. Friendly, English-speaking hosts live next-door. Easy access to public transport. Discounts for long-term rental available. Quiet location in a residential area of the city, a 10 minute drive from the city center. This comfortable, fully equipped 36m2 studio is ideal for a single traveler. The private balcony offers a panoramic view of the city from the 9th floor where the studio is set. Studio apartment 40 $ / Simferopol / 4 , Samokisha str. 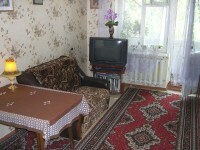 This reasonably priced, good value apartment will be the perfect place to stay for your next trip to Simferopol. It has one bedroom, fully fitted kitchen and bathroom. There is WiFi, cable TV, air-conditioning, all kitchen appliances. The location is very convenient, within a 5-10 minute walk from the main shopping area, banks, restaurants, nightclubs, cultural and tourist attractions. Also you will find a lovely park right across the street from the house. Studio apartment 40 $ / Simferopol / 28 , Zhelyabova str. Within a 3-5 minute walk you can reach plenty of restaurants, super markets, banks, tourist shops, travel agencies and more! This good, budget proposal is definitely worth considering! Studio apartment 40 $ / Simferopol / 13/6 , Geroev Adzhimushkaya str. This small studio apartment is set right in the heart of Simferopol, only one block from the lively city center. Although it is so central, the location is quiet, without any traffic noise and it is very safe, too. There is everything you may need for a comfortable stay: Free WiFi, TV, air-conditioning, a kitchenette and bathroom. This accommodation will work perfectly for a single traveler or a couple. Luxury, elegant studio apartment in the central area of Simferopol. 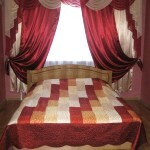 A spacious bedroom has a king size bed and fold out sofa, new comfortable furniture. All needed consumer electronics: air-conditioning, cable TV, DVD player, microwave. Broadband Internet is available as an optional extra. The central location will allow you to reach easily downtown attractions, restaurants, shopping and nightlife hotspots. Superb location, modern facilities - all the best for your rest, relaxation and entertainment. Studio apartment 45 $ / Simferopol / 22/2 , Sevastopolskaya str. A lovely romantic studio, very centrally located near Trenev Park. All the comforts of home, and all modern amenities for your convenient stay! Ideal for a business traveler in need of a location convenient to downtown or for a romantic getaway. 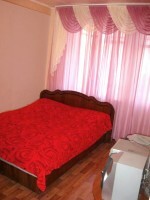 A clean, well-maintained, fully furnished studio apartment situated in the very center of Simferopol. It has been fitted, furnished and equipped with everything you may need for a short term stay, including WiFi and a washing machine! Easy access to downtown and all parts of the city! 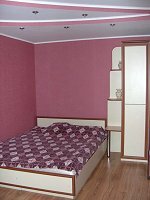 Studio apartment (2) 45 $ / Simferopol / 30 , Gorkogo str. Two similar studio apartments in the same building: on the ground floor and upstairs. The apartments can be rented separately or together. The house is perfectly located in a quiet courtyard, yet in the very central area. Most attractions of Simferopol are within a walking distance. Minutes away from the main pedestrian area, shopping, dining and nightlife. Studio apartment 45 $ / Simferopol / 2 , Treveva str. A newly refurbished, modern studio apartment located near the Kuibyshev Square, only minutes away from shopping, fine dining, nightlife. All the conveniences are just steps away from your home. The apartment is designed with your comfort and needs in mind. It is fully furnished, well fitted and can accommodate up to 2 adults and a child. Easy access to public transportation. Broadband Internet is included in the price. 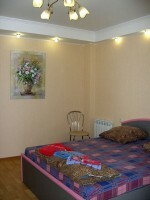 Studio apartment 45 $ / Simferopol / 2 , Treneva str. This newly refurbished, modern studio apartment offers a great location near the Kuibyshev Square in Simferopol. All the conveniences are just steps away from your home. The apartment is very clean, fully furnished, and has everything for your comfortable stay, including Broadband Internet . The bedroom is appointed with a double bed and a fold out couch. A superb, professionally updated up to western standard apartment is located in the heart of downtown Simferopol. The windows overlook the Council of Ministers of Crimea and Lenin Square. You'll have the best of Simferopol right at your doorstep! Studio apartment 50 $ / Simferopol / 7 , Morozova str. 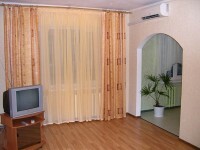 A modern studio apartment located near Central Gagarin Park, in a very quiet, family-oriented neighborhood. All windows face a quiet and sunny courtyard, so there is no traffic noise whatsoever. Yet, it is only a 5 minute walk to the main shopping and business centre of Simferopol. 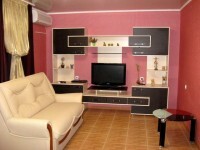 The apartment was completely renovated and redecorated in 2010, and newly furnished. Broadband Internet is included in the price. This modern studio apartment has recently been professionally updated up to western standard and fitted with a traveler's needs in mind. It is well laid out and has everything you may need for a comfortable stay: WiFi, air-conditioning, washing machine, full kitchen. The apartment is a perfect accommodation for a single traveler or a couple. The central convenient location is another advantage. There are a lot of dining, shopping and entrainment opportunities within a 3-5 minute walk. Car parking is available nearby. Studio apartment 55 $ / Simferopol / 9 , B.Khmelnitskogo str. This delightful charming apartment with stylish interior was completely renovated and refurbished in 2012. It is an ideal hideaway for a single traveler or a couple in the heart of Simferopol. The accommodation has all the mod cons and designed to meet your every comfort. Amenities include: air-conditioning, broadband Internet, cable TV, washing machine, back-up water heater etc.